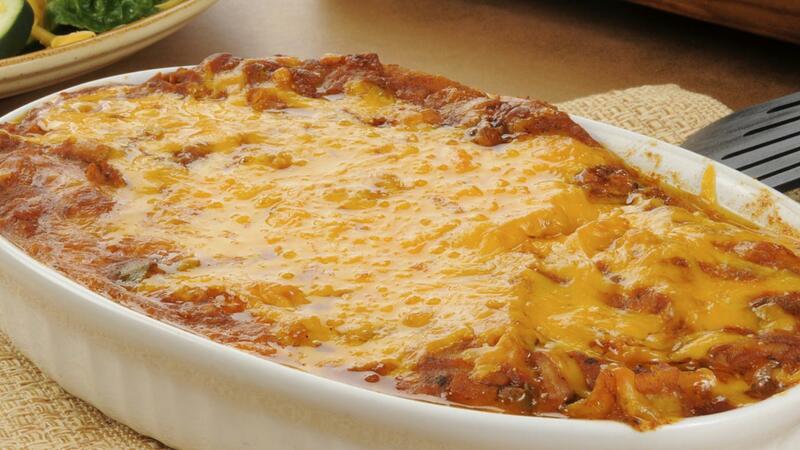 How Do You Make a Baked Taco Casserole? A baked taco casserole is made by putting browned hamburger meat, refried beans, seasonings, cheese and tortilla chips into a pan and baking the dish in the oven. Lettuce, tomato and sour cream are added to the top just prior to serving. Making a baked taco casserole begins with browning 1 pound of ground beef and draining off the fat. Stir in 1 package of taco seasoning, 1 16-oz can of refried beans and 1 jar of thick and chunky salsa and heat until boiling. In a baking dish, place 2 cups of broken tortilla chips, and top with the meat mixture. Sprinkle the top with 1/2 cup chopped bell pepper, 4 sliced green onions, 1 cup of chopped tomato, 1/4 cup of black olives and 1 cup of Mexican cheese blend. Bake the casserole uncovered for 30 minutes at 350 degrees Fahrenheit. Top the baked casserole with lettuce, 1/2 cup of tomato and 1/2 cup of broken tortilla chips. Serve with extra tortilla chips and sour cream. Cooks can alter the spiciness of the casserole by using diced green chilis into the meat mixture before baking. Spicy refried beans and spicy taco seasonings can also be use in place of a more mild seasoning packet. How Do You Make Cream Cheese Corn Casserole? How Can You Make an Easy, Healthy Taco Dip? How Do You Make Baked Grouper?